When looking at the monitoring of flows in many piped and open channel situations the issue has always been the monitoring of flows at low levels. 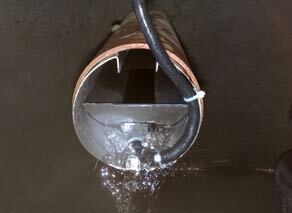 RS Hydro were asked to install a meter to monitor flows in a 4' pipe, where levels were dropping to less than 50mm. The ISCO 2150 area velocity flow meter with low profile area velocity sensor and customised 4' spring ring. Since the first forms of open channel flow meter emerged the problem has always been the monitoring of flow at low water levels, although many methods exist to combat this problem resulting issues still occur. Piped flows have always been one of the hardest to monitor especially during low flow conditions, because many flowmeters need to have full pipe conditions to ensure there function. This in many cases can mean that systems have to be designed on to existing structures to ensure these units work effectively. In many circumstances the best method of flow monitoring is one where the flow meter can be installed and removed quickly for both installation and maintenance requirements and one where costs are kept to a minimal, with a large emphasis placed on time from initial selection of the equipment to an installed flow meter. In channel sensors have been seen to emerge in recent times as a solution to resolve this issue in particular The ISCO 2150 with its low profile area velocity sensor. The 2150 works using Doppler technology, this transmits a frequency which reflects off particles in the water, this then is received by the receiver on the sensor. Here any change in frequency shows the velocity and the direction of this velocity depending on the frequency, higher the frequency the flow is moving towards the sensor, lower the frequency. Where the 2150 has many advantages over other such units on the market is the fact that the unit is able to measure velocity down to 25mm this makes the flowmeter ideal for low flow conditions where most in channel sensors would not be suitable as many operate in the region of 75mm to 100mm and there water passing through the pipe at low flows can go unnoticed. When RS Hydro were asked to measure flow in a 4' pipe where water levels were generally low, it was the ISCO 2150 which was chosen based in its reputation to monitor such situations. The 2150 sensor was installed on a 4' mounting ring which was modified to cope with potential flows which may occur when water levels may drop below 25mm (see figure 2). The sensor was installed very quickly with this only taking around 2 minutes to achieve. The flowmeter was then programmed to the dimensions of the pipe and data storage on the unit was then setup to record level, velocity, flow rate and total flow. With unit being battery powered the unit was then located near the chamber lid for easy access and maintenance. With the whole installation taking only 60 minutes the method can be said as a quick easy and reliable resolve to the problem of low flows and ultimately one of the most accurate ways of measuring low flows in a scenario where most flow meters would fail.